Franco-Flemish painter, studied in the Antwerp studio of Abraham Janssens, one of the few northern painters to have been in Rome during Caravaggio s lifetime. Although Rgnier s life has not been the subject of exhaustive investigation, it is clear that he was in Rome between June 1621 and 1625, and may well have arrived there as early as 1615. There is compelling evidence in his Roman work of formal contact with Bartolomeo Manfredi; their styles can be so close that some works have been misattributed. Joachim von Sandrart statement in his Teutsche Academie of 1675-79 that in Italy Rgnier followed the method of Manfredi supports an association. Sandrart, who met Rgnier, also reported that he became a member of Vincenzo Giustiniani s household. Rgnier served as Giustiniani s official painter, and as many as nine of his works are recorded in the Giustiniani collection. 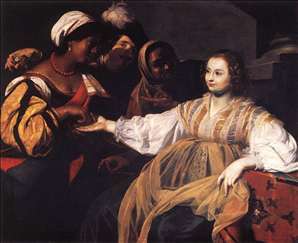 In Rome Rgnier was also in close contact with other French Caravaggisti, particularly Simon Vouet. 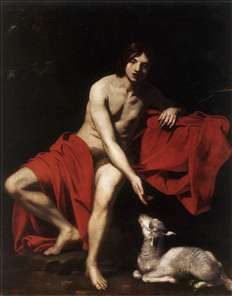 By June 1626 he had moved to Venice, where he soon moved away from Caravaggism, developing instead an increasingly decorative style. Between 1625 and 1630 Rgnier s art was affected by the work of the German painter Johan Lys, who was then in Venice for the second time; his influence is particularly evident in Rgnier s newly painterly depiction of flesh. Rgnier, or Renieri , as he chose to be known in Italy, remained in Venice for the rest of his life. In addition to painting, he began dealing in antiquities and established a collection of paintings which was well regarded. 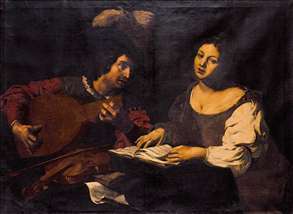 See more details about "A Musician Playing a Lute to a Singing Girl"